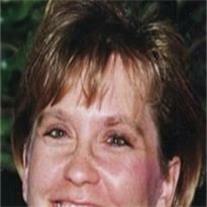 Cindy Lou Capron Biesemeyer, 53, returned home to be with her loving Heavenly Father on March 3, 2011. She was born on April 21, 1957 in Warren, PA to Ellen Louise Vaow and Gilbert Otto Capron. She died surrounded by loved ones in her Mesa home of 30 years. She was preceded in death by her father, her brother, Gilbert Capron, Jr. and her sister, Cathy Ishman. She is survived by her mother and step-father, Ellen and Larry Wallace of Pittsfield, PA and her siblings: Sue Capron Bennett, Sherry Catalfu, Patty Chase, Bob Capron, Ken Capron, Jeff Wallace, Ken Wallace, Matt Capron, Karen Wallace and Tammy Wallace. She will also be sadly missed by her husband of 37 years, Dan Biesemeyer and their children Shane Biesemeyer, Shannon Powell, Brandon Biesemeyer and Breanne Bergman and 12 grandchildren. Cindy’s greatest legacy will be her love for her family, love of service to others and for her faith and great love for her Father in Heaven. A visitation will be held on Thurs, March 10, 2011 from 6-8 pm at Bunker’s Garden Chapel 33 N. Centennial Way Mesa. Services will be held on Fri, March 11, 2011 at 10 am at the LDS Church 1455 N. Harris in Mesa. In lieu of flowers, donations can be made to Wells Fargo acct 1343926158 to help with medical and funeral expenses.